We were pleased to be the first to introduce this superb new variety in 1988. The first ever sweet black cherry, that is self fertile and can be grown on its own with no other pollinator required, Sunburst is quite superb. The large, black, juicy fruits have a gorgeous flavour, and the crop is heavy. The growth habit is similar to Stella and makes a good, easy to manage tree. Ripening in early July, Sunburst really is going to be a superb variety for garden culture. 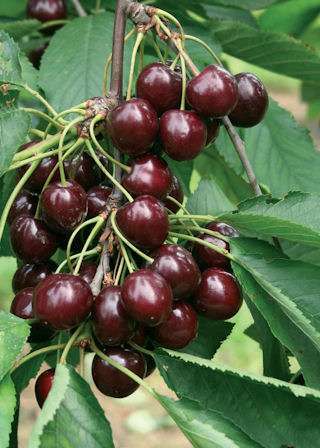 Raised by the same research team as Stella, the first self fertile, dark red cherry Sunburst, with those luscious black fruits, is going to be even better. Perfect for the one tree garden. Very heavy cropping, good split resistance. Highly recommended.